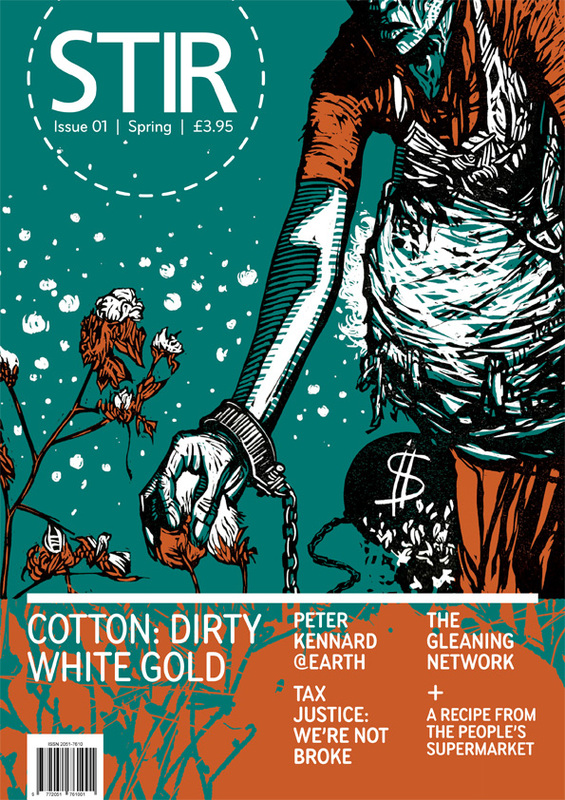 Our first issue features filmmaker and activist Leah Borromeo writing about her film Cotton: Dirty White Gold and why 300,000 Indian farmers have committed suicide since 1995 — one every 30 minutes. Fergus Walker of the Fife Diet — Europe’s largest local food movement — talks about how engineering and design (his People-Powered Flour Mill) can be used for social change, and organiser and lawyer Marina Sitrin explains how members of the Argentinean Recuperated Factories movement have recently supported Greek workers to transform their factories into cooperatives. As a response to the global food waste scandal — with up to 20 million tonnes wasted in the UK every year — the Feeding the 5000 team explain how we can get involved in the Gleaning Network and join the ‘Arable Spring’. In an interview with journalist Nicholas Shaxson, author of Treasure Islands: Tax Havens and the Men who Stole the World, he talks about how the work of the Tax Justice Network undermines the argument for austerity and how tax avoidance is central to our global economy, while resistance to this offshore industry is captured in the efforts of the activists US Uncut in Karin Hayes’ film We’re Not Broke. As the 10-year anniversary of the invasion of Iraq passes we look at Peter Kennard’s shocking and unsettling photomontages from @earth and a founding member of Stop the War Coalition, Chris Nineham, argues the importance of taking to the streets to let our leaders know how we feel about war. The magazine will also feature regular columns from climate campaigner John Stewart and from the social reporters of the Transition Network who will keep us updated with these movements. We also have a recipe from The People’s Supermarket London and an open source beer recipe for you or your favourite brewer to try.